Make sure you purchase the right ink cartridges for your specific printer and printer region or have your old ones refilled. Cartridges are not compatible between different brands, and often not within the same brand. Unlike other inkjet manufacturers, HP designs its inkjet hardware to use country-specific consumables. When you unbox a new HP inkjet printer and set it up, you install a set of ink tanks that ship with the printer. As you turn on the device and get ready to use it, an initialization sequence localizes it to the country associated with the ink cartridges you installed. HP recommends that you use Original HP ink cartridges. If one of the ink cartridges runs out of ink before you can replace it, you can still print with a single ink cartridge. Printing with one ink cartridge might be slower and the print quality might be affected. It is recommended to print with both ink cartridges. For borderless printing, the tri-color ink cartridge must be installed. Which ink cartridges do I need for my HP Officejet 100 (L411) Mobile Printer? HP 98 Black or HP 94 Black cartridges AND HP 95 Tri-color or HP 97 Tri-color or HP 93 Tri-color cartridges. For your European or UK HP Officejet 100 (L411) Mobile Printer you need HP 337 Black or HP 338 Black cartridges AND HP 343 Tri-color or HP 344 Tri-color cartridges. 1. Press the Power button to turn on the product. 2. Open the front access cover. Wait until the carriage is idle and silent before proceeding. 3. Lift the cartridge latch, and then gently remove the cartridge from the carriage. 4. Remove the new ink cartridge from its package and then pull the pink tab to remove the protective film from the cartridge.
! Do not touch the copper-colored electrical contacts or the ink nozzles ! 5. Insert the cartridge at a slight angle into the carriage slot. Place the tri-color cartridge in the left slot, and the black or photo cartridge in the right slot. 6. Close the ink cartridge latch. If the cartridge is inserted correctly, closing the latch gently pushes the cartridge into its cradle compartment. Press the latch to make sure it is seated flat on the cartridge. 6. Close the front access cover. 7. 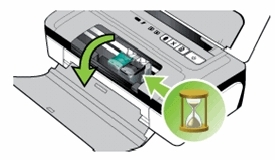 Wait for the carriage to complete the ink cartridge initialization routine and return to the home position at the left side of the printer before using the printer. 8. Align the ink cartridges. Whenever you install a new ink cartridge, you should align the ink cartridges for the best possible print quality. If the printout is grainy, has stray dots, jagged edges, or the ink is bleeding into another color, you can realign them through Toolbox, or HP Utility (Mac OS). 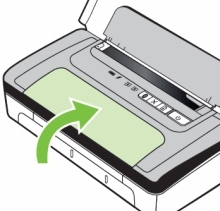 Load plain paper into the input tray before aligning the ink cartridges. An alignment page is printed during the alignment process.